Those coming with us on our experience of the Exotic Marigold Hotel, might like to see this short video. Judy Dench and others give their views, on what promises to be a wonderful experience. 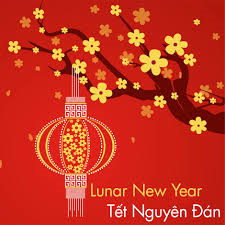 Whilst the West – as well as Australia, New Zealand and the Americas – celebrate new year on the 31st December, for much of Asia – particularly China and Vietnam – they celebrate the Luna New Year – known in Vietnam as ‘Tet’ in February. Since ‘Lunation’ (a full moon) occurs approximately every 29 days, a lunar year is 354 days. So for the people of Vietnam, China and Laos for example, new year has not arrived yet. The 31st of December: just an ordinary day. In Nepal there are several ‘new years’ but that’s another story…. Nepal 2018, and the tour has come to an end. Yet again, this adventurous journey was a great success, staying in ancient cities, the jungle, cycling around the birthplace of the Buddha, wonderful Pokhara and so much more, thanks to all those who came along. 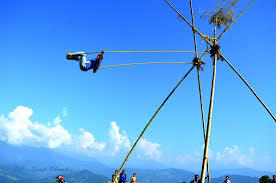 We also witnessed the festival of Deshain. Already plans are afoot for October next year, with the addition of a Bhutan add-on; so contact us, if you’d like to join the wait-list for this fabulous experience. The end of November will mark the beginning of another cold winter here in Nepal. But come March, the sunshine, blue skies and warmth will return again…and so will Angel Holidays. Contact us here if you want to take part. For those coming with us to Bangkok, Laos and Cambodia this year, you’ll be staying in some comfortable hotels. 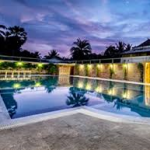 The Classy Hotel (featured here) for example, has a large pool and spa with good massages, to relax after your day going through the heart of Cambodia by traditional boat. This is a place David Beckham has stayed in. In Phnom Penh your hotel will feature a roof top pool and Jacuzzi overlooking the Mekong. Other hotels are more classic, such as the Riverside in Nong Khiew where you’ll enjoy stilted bungalows overlooking a jungle river. You’ll have wonderful weather too. Whilst back in the UK it will be a grey cold afternoon, here it will be over 30, with warm sunshine. Contact us, if you might like to come. This cheeky little video will hopefully bring a smile to your face, well done girls! For those coming on holiday to Nepal with us (or thinking about it) here is a clip on UK radio. One of our travellers recounts her experiences, we hope you enjoy the show. Today we travel by train across the desert and reach Bissau Palace, Jaipur; where we’ll stay for two nights. Below is a video of our unusual palace hotel, the oldest in the Jaipur. In fact Angel Holidays is friends with the Royal owners, the first room featured is Steve Carver’s residence when he stays longer term. Later the group will visit Amber fort by jeeps followed by a walk through the hidden alleyways of the city (an area not visited by tourists) to see where the poor live and make a living by selling puppets. 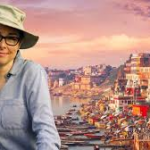 India, and with the Sue Perkins series ‘Ganges’ gaining in popularity, maybe now is the time for you to travel to India. On our classic road trip we explore the cultural heart of the nation, visiting areas and driving roads seldom seen by tourists. Our journey is one of extremes: remote villages, busy cities, camping in the desert, trains, the Exotic Marigold hotel, Taj Mahal, camel riding, old palaces, maharaja havelis, lakes and unusual glimpses into this fascinating culture. If you want a ordinary sightseeing tour this is not for you, but if you like Sue’s type of travel, it is. Steve Carver from the BBC is leading this adventure. Up here in the Himalaya the year is 2074 and next week, the country will celebrate the festival of lights known as Diwali. Our group will stay in the ancient city of Bhaktapur, next week, where all the old houses will be lit with candles. In the festival, they also worship dogs -they’re seen as loyal animals. 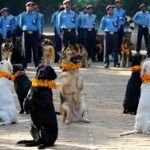 Here at the Nepalese police academy, canine officers receive their honours – which include a tika (a red dot on the forehead as a blessing) and garlands. If you might like to come to this unusual country with us next year, dates will be issued soon.